Vista Alternative High School Principal Brett Surguine’s new office was still being furnished when the 2018-19 school year was fast-approaching. Surguine was officially named the new VAHS leader on July 25, the new campus was slated to earn its certificate of occupancy a day later, and school was to begin a week after that. But the eight-year Yuma Union High School District veteran had prepared for the task throughout his career in education. Since that original experience, Surguine, who is from Scottsdale, has earned two master’s degrees in Secondary Education and Education Leadership from Arizona State University and Northern Arizona University – Yuma, respectively. 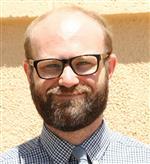 He began his tenure in Yuma in 2010 as a teacher at Cibola High School and has served as an assistant principal at Yuma High School and Gila Ridge High School before moving to Vista Alternative. Even in his brief time on the job, Surguine has made a point of understanding how to connect with students at Vista Alternative. Making VAHS feel empowering for its more than 150 students, has been made easier by the opening of its new campus at 3150 S. Avenue A, allowing teachers and administrators a bit of a clean slate.